Dr. Forrest's Cheeze Factory: It's ABOUT Time! always keeps up with the latest coiffures. will always look yer best when ya hasta to fetch more twinkies! I had one of these. There is, somewhere in a box of photos, a picture of me wearing it proudly. God help me if someone else finds it before I do. 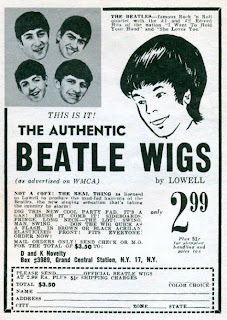 Who ARE these "Beatles" everyone keeps referring to?